Aim the first bird for the part-open box underneath the bird cages, it should go through them, crashing the cages, releasing the birds and then on to the next set of boxes for extra points. The last birds should then give you a three star rating. 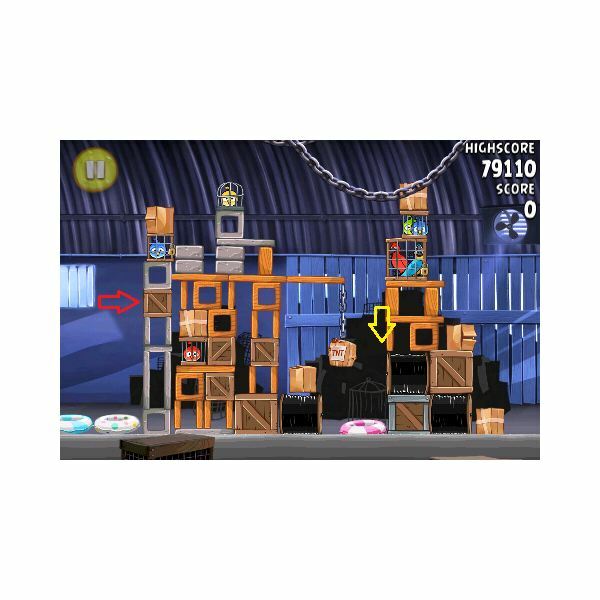 Aim this bird for the middle box on which the first cage is resting, this should knock down the cage and the bird should roll to the box at the bottom of the second structure knocking that down also.The remaining birds help you to get three stars. 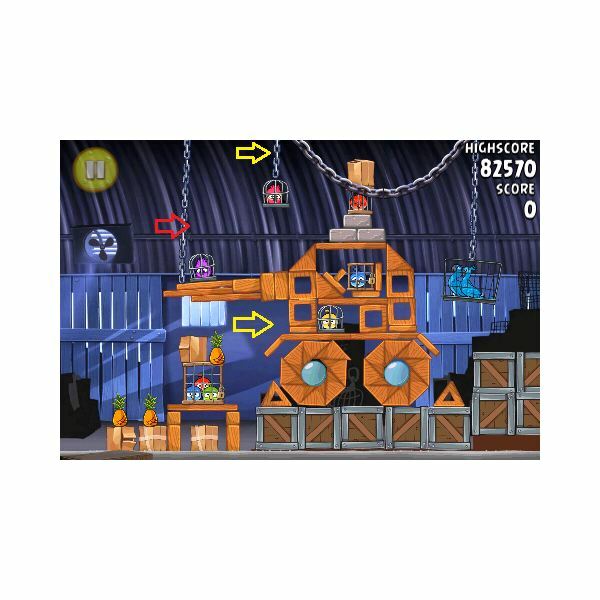 The bird here should be aimed at the top of the closest cage to hit the cage and plough through the boxes in its path. This will tumble the structure destroying the remaining cages. 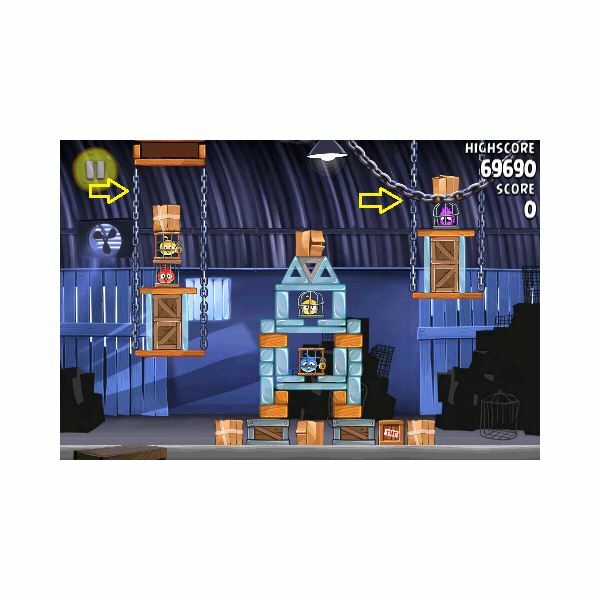 Aim this bird to hit the top of the grey slab on the first structure to topple it, it should then fall to the next, hitting the remaining cages and releasing the birds. Aim the bird high to hit the top of the silver pendulum, sending the bird to fall to the bird cage on the right and the pendulum to fall to the structure below, toppling the structure and destroying the cages. 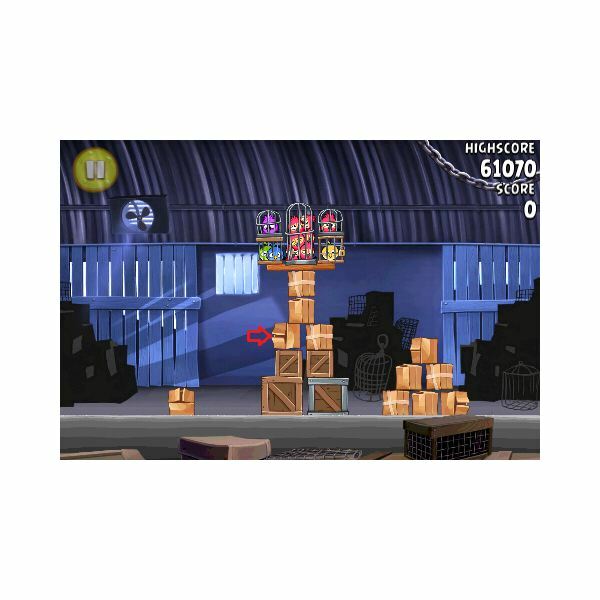 Aim the first bird for the side of the first small structure and tap as it flies over the three blocks. This will destroy the first structure and hit out the side of the next. Aiming higher, the next bird should be shot to hit the top corner of the next structure, destroying it with the birds going through to the last one. 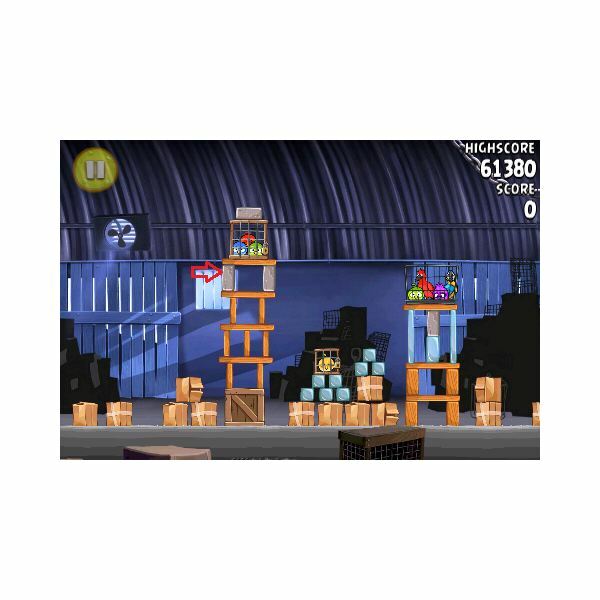 This bird should be aimed to hit the corner of the tallest structure, and tapped to release the extra birds as it reaches the wooden blocks. This should then hit the first cage, the birds flying on to hit the structure and last cages. This one may take some practice, aim the bird quite high, aiming to hit the top of the grey slab on the highest structure. Then tap as it passes the fan in the background. The lowest birds will then cause some damage whilst the bird at the top will fly through the blue pane holding the grey slabs back. These will fall and destroy anything remaining. 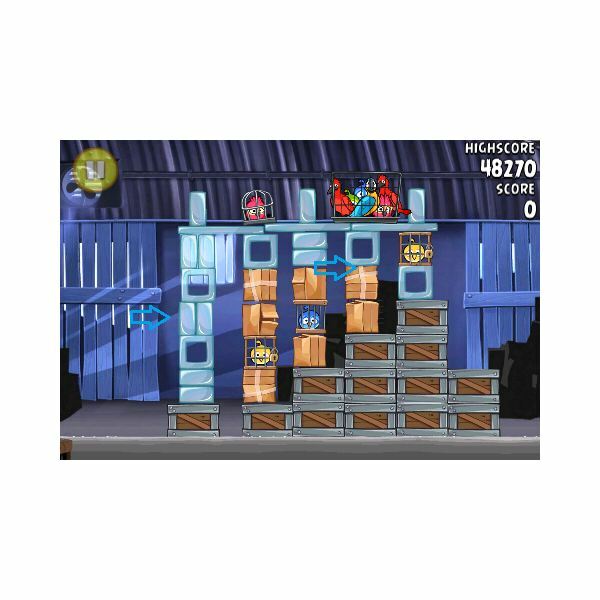 The first bird should be aimed almost straight ahead, directly for the blue brick ahead, tapping the screen as it flies past the door in the background to completely demolish the first structure. Aiming only slightly higher, the next bird should be shot to hit the closest box, ploughing through and causing the last cage to fall. This bird should be shot towards the top corner of the structure closest and tap the screen just before it flies past the fan in the background. Aimed correctly, this will topple the first structure, sending it into the second and then the third, dropping all the cages in turn. Aim the first bird to go through the plank above the first cage and tap just before it hits and it will collapse the first structure and go through the next, leaving just the furthest cage intact. Aiming the last bird slightly higher than the first, it should hit the bottom planks to collapse the final structure and cage. 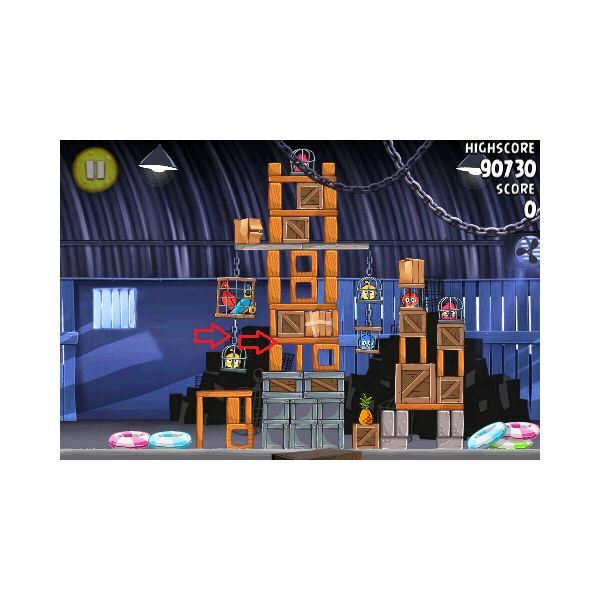 The first bird should be aimed just over the cube by the closest planks to shoot through and collapse the whole structure, releasing the caged birds. 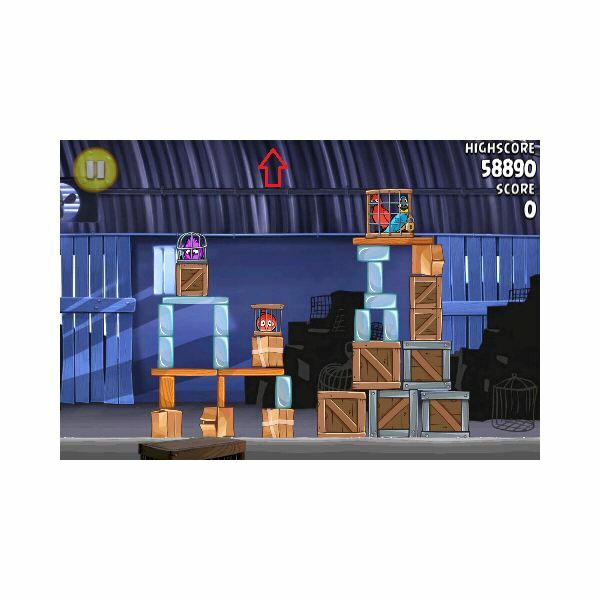 Aim the first bird high into the air to go through the lower box on the furthest structure which will shoot through and collapse it on to the first structure. There should be one cage left at this point so just shoot the last bird directly for it. Aim this bird directly for the box in the left side of the structure to collapse the whole side. The second bird is a little trickier and should be aimed high into the air to drop between the remaining two structures and skim the side of the furthest one. This may take two birds to get right. It will take out a supporting plank and collapse it on to the last structure, destroying the remaining cages in the resulting explosion. 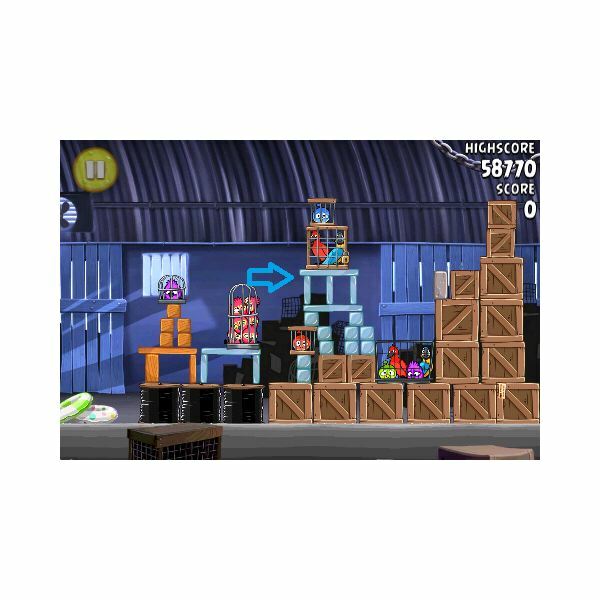 Aim the first bird for the blocks holding up the first bird cage which will be destroyed and the bird will fly to the next structure, collapsing that also. The next bird can be aimed a little higher to hit the middle of the next remaining structure to collapse it. The last bird can then be aimed for the last structure housing the remaining bird cage. 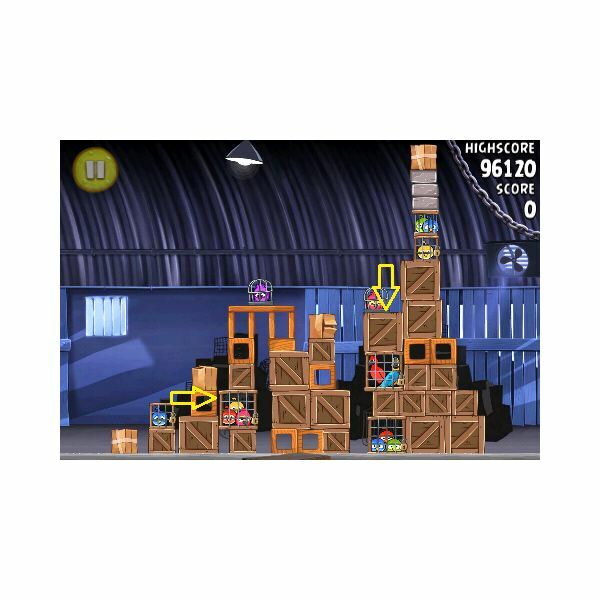 Go to page 2 for how to get three stars in Theme 2 of Smugglers Den! Aim the first bird for the chain connecting the two closest cages, it will then hit the structure, weakening the beams. Aiming the second bird in the same path, it should knock through the structure and the next, destroying each cage. You can still have a 3 star rating if you need to use the last bird to do this. Aim the first bird for the plank sticking out of the first structure and tap as it gets close. The force should destroy it and push the next structure over, destroying the cage on top. The second bird should be aimed higher, just above the closest remaining cage, tap before it reaches to destroy the cages in reach, leaving the two at the far end remaining. The last bird should be shot high to hit the corner of the closest cage, tap as it flies over the rubble and the force will destroy the last bird cages. 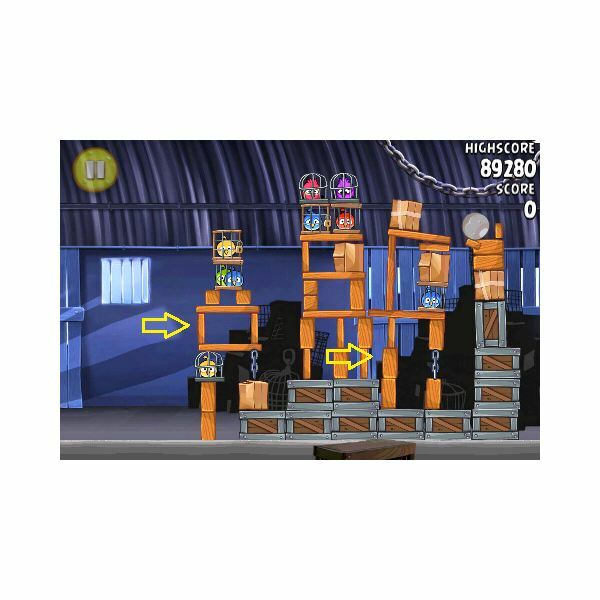 The first bird here should be aimed high into the air to fall into the fruit dangling on a chain, then continue into the structure below to collapse the beam and cause the structure to fall on the middle part. Each cage will be destroyed in this process aside from the one to the far left. The last bird can be aimed directly at the last cage. Aim the first bird high into the air to go through the chains holding the floating structure to release the caged birds. 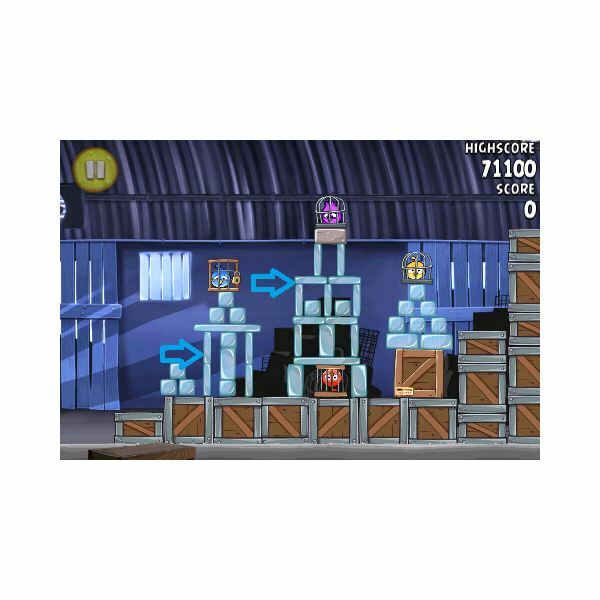 The second bird should be aimed slightly lower to do the same to the far floating structure, as this falls the TNT will be detonated and destroy the ground structure. 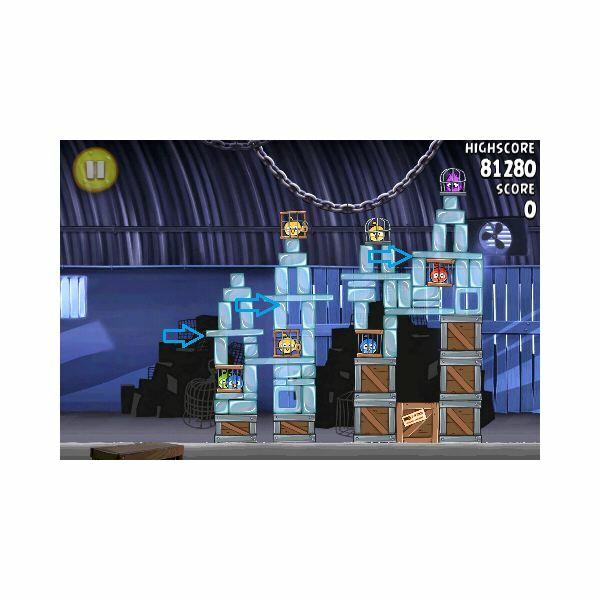 Using the last bird on this level can also give you three stars. 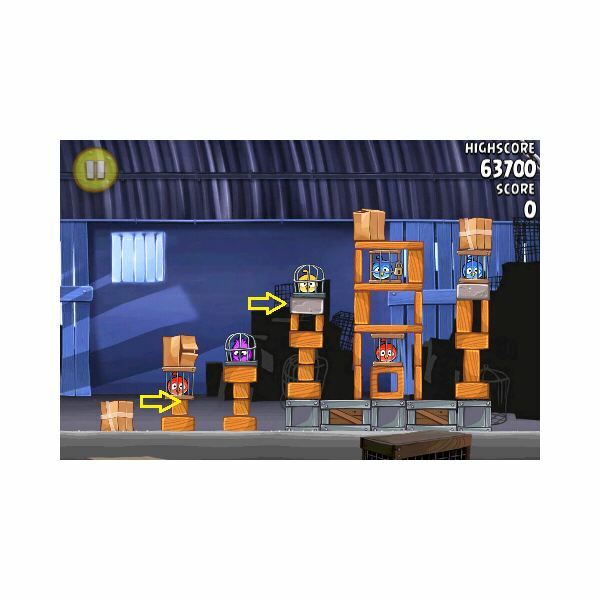 A little tricky to get right, aim the first bird at the middle of the closest side of the structure and tap to destroy the first three cages. The second bird can be shot a little higher and tapped before it hits the blue square to release the final birds from their cages. 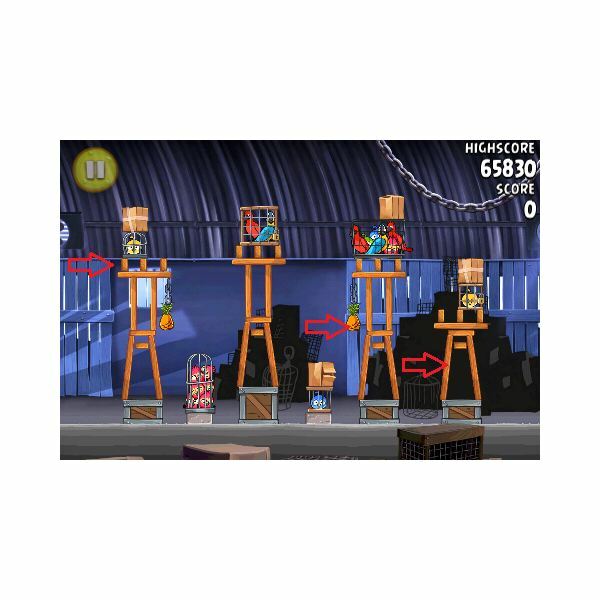 The first bird should be aimed to hit the planks just under the second closest cage, this will fall and rest on the structure next to it. 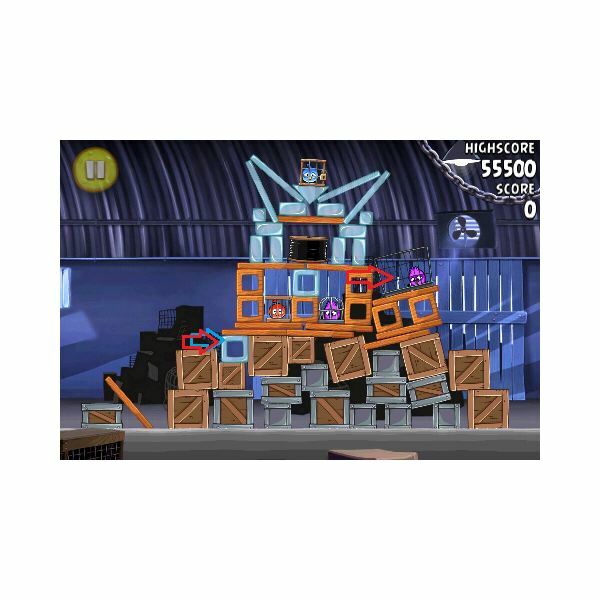 The second can then be aimed lower to hit the cage closest and fly on to hit the resting structure to topple it, this will have a knock-on effect to topple the rest and destroy the remaining cages. The first bird here should hit the plank under the closest cage which will release the first birds from their cage. 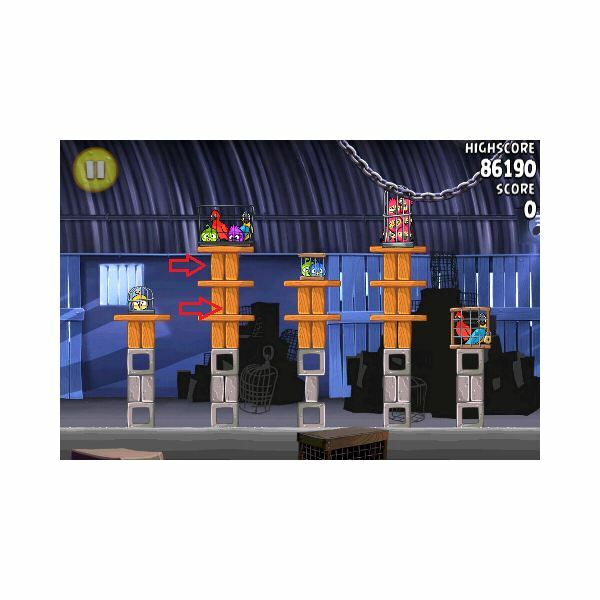 Aiming a bit higher, the next bird should be sent in the same path to hit the bottom beams, collapsing the structure and leaving two cages remaining. 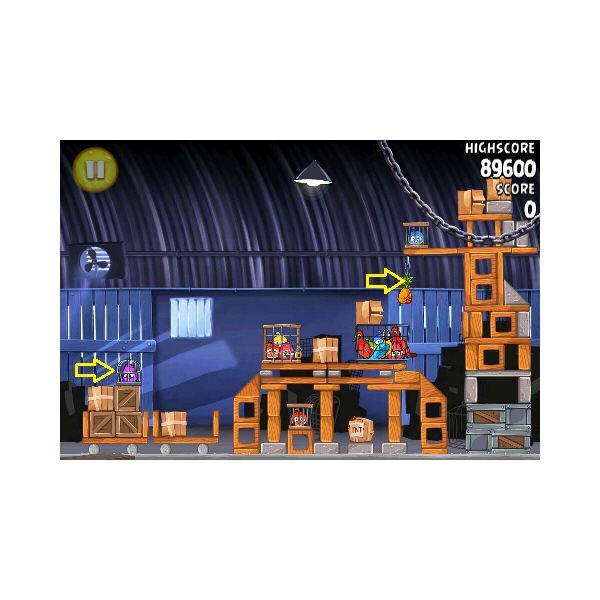 Aiming in the same direction as the last send the third bird to crash through the boxes and destroy the last cages. 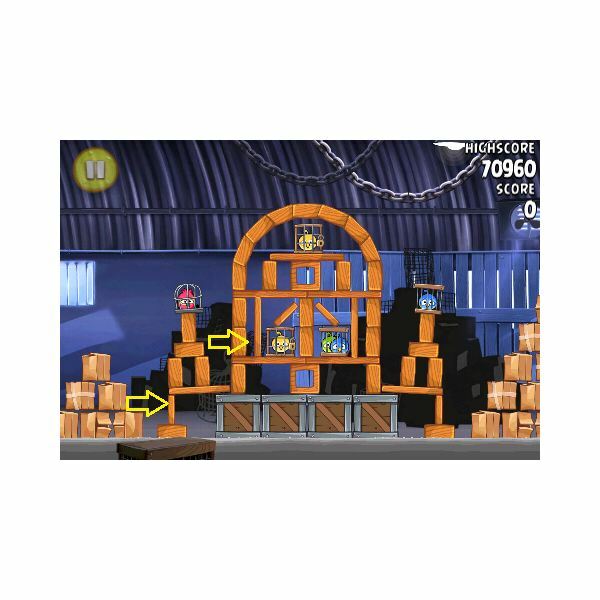 This bird should be aimed low at the box to the side of the structure, tapping to fly through it and take out the beams holding the structure up, collapsing part of it. The next bird should be aimed higher at the cage resting on a pole to collapse the rest of the structure, leaving one cage remaining at the base. Use the last bird to hit the last bird cage. Again, the trick here is to aim the first bird for the box at the base of the structure to fly through collapsing the first two parts of the structure. Aim the next one high to hit the floating cage and cage to the right. Lastly, aim this bird for the cage at the base of the last structure, toppling it and the last two cages. 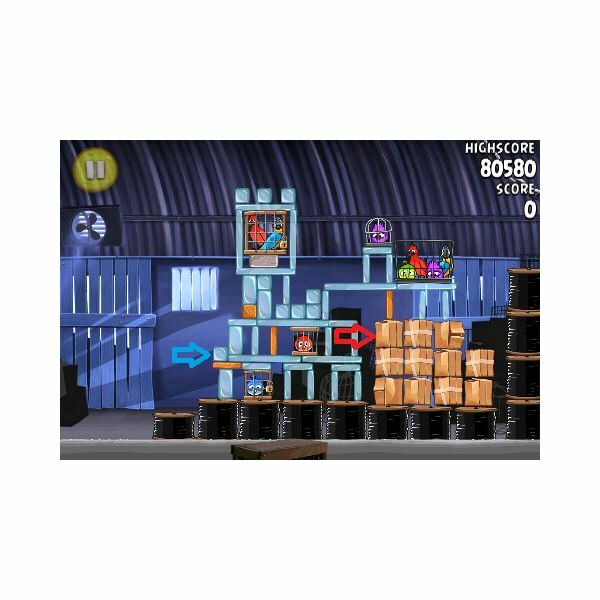 This level is a bit tricky, the first bird here can be aimed at the boxes to the side, it should plough through the side of the structure to collapse the first part. Now the next bird can be aimed higher to go through the structure and on to the next cage, the last two will then fall as a result of the structure collapsing. 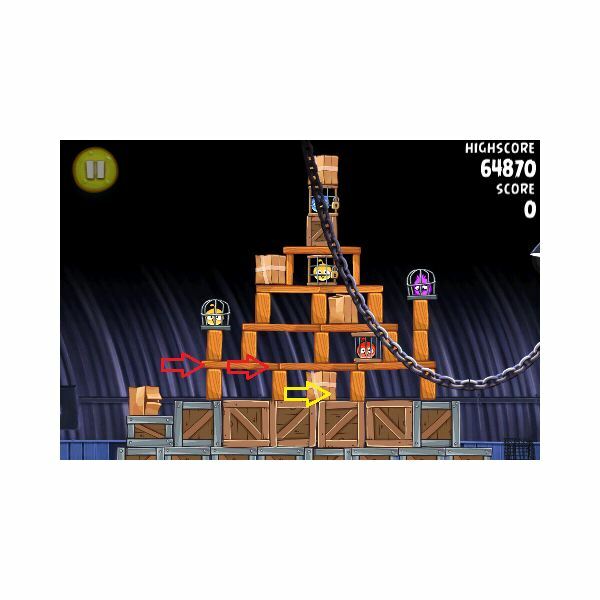 Aim the first bird directly towards the grey plank to knock it into the next structure and collapse into the other structures to the left. The next bird can then be aimed to hit the closest cage and fly into the next, destroying them both. 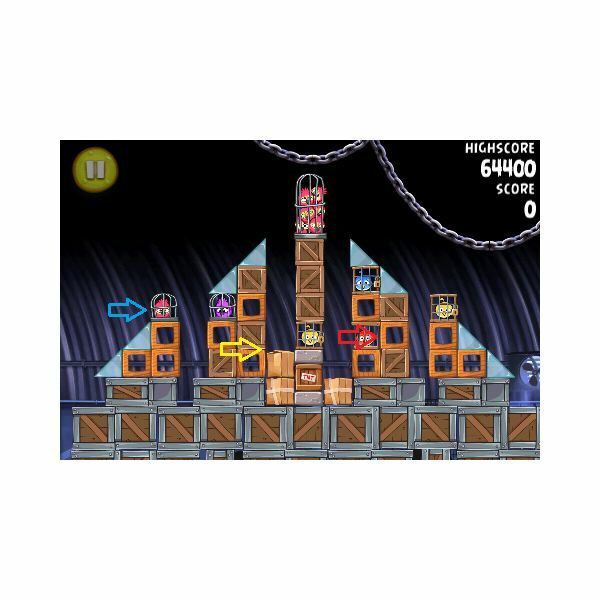 The first bird should be aimed to hit the closest cage, as it gets close, tap the screen and the birds will release the first two cages. 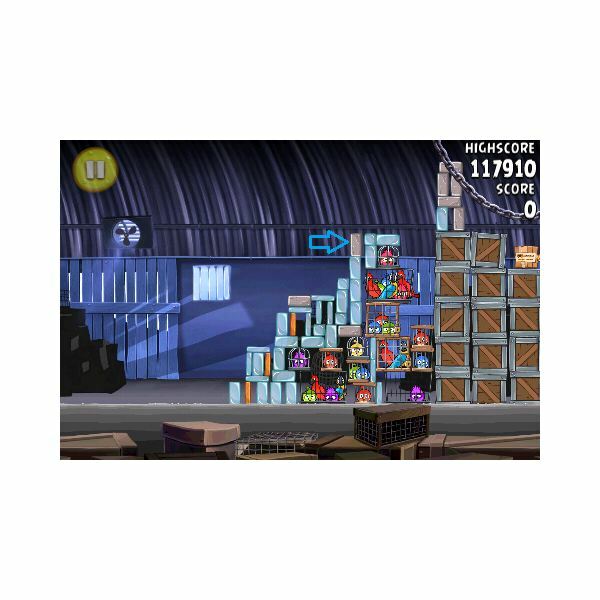 The next bird can be aimed for the TNT, ploughing through the boxes, and the explosion will destroy the tallest section. Finally, the last bird can now be aimed at the lowest cage, pushing the furthest over and destroying the last cages. This can be a bit tricky to do, but even using the remaining bird you can achieve a 3 star rating. Aim the first bird high into the air so that it falls on top of the lone yellow bird cages alone. This will collapse the structure, demolishing each cage to the left. 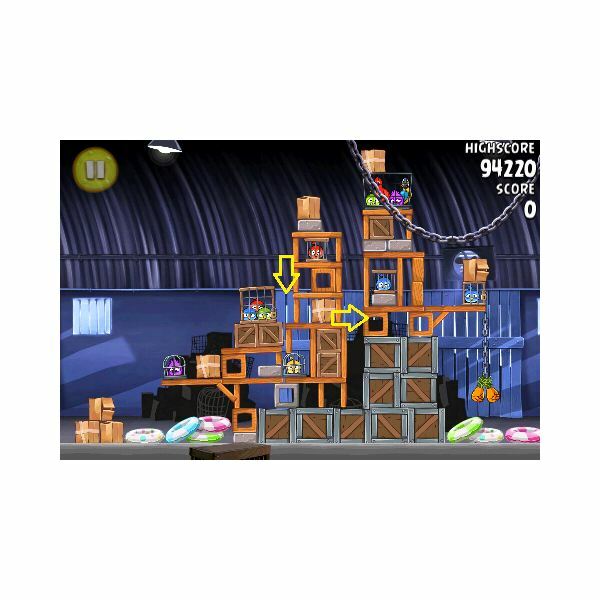 Use the next bird to hit the cut out square on the remaining part of the structure to demolish the last cages. 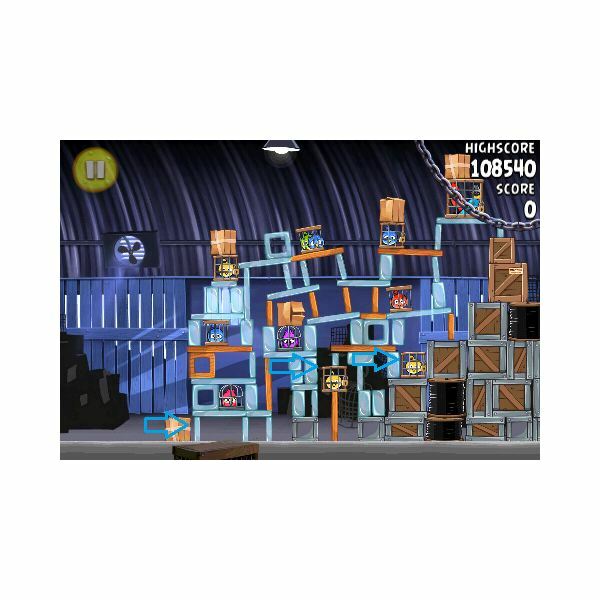 This level proved the most difficult for me, but take the first bird and aim it to hit the lone blue square at the bottom of the structure, tapping it just before it hits to dent the surrounding boxes. 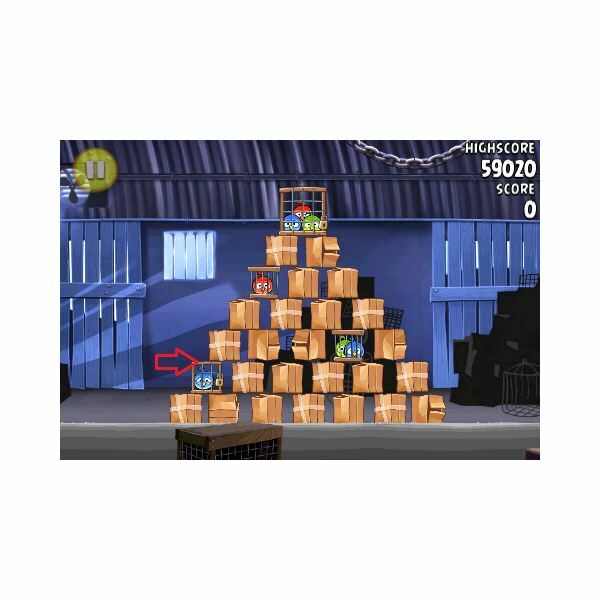 Take the next bird to fly in the same path and go through the boxes, this should collapse the structure and destroy the first three cages. The last bird should be used to hit the last cage. The first bird here should be aimed to hit the chain holding up part of the structure. Aim the next bird for the front of the closest wheel which will result in the destruction of all of the grounded cages, leaving two floating. The last one can then be aimed high and rip through the first chain holding a cage and fall on to the last cage. 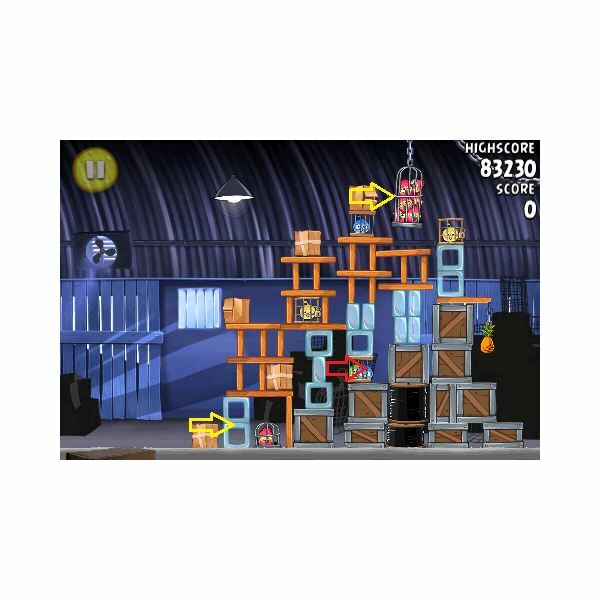 Do you have another way of completing the first two themes of Angry Birds Rio Smugglers Den? Post a comment and share it with us! 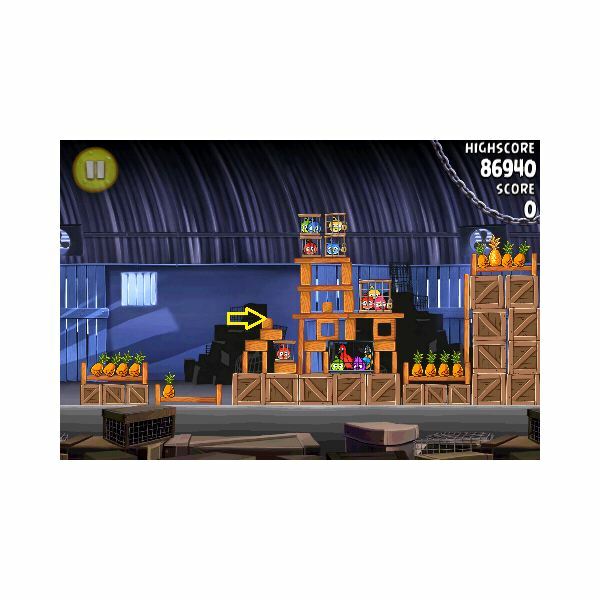 All screenshots from Angry Birds Rio on iPhone. Releasing caged birds, killing monkeys and battling giant birds – the excitment continues with Angry Birds Rio, and here we show how to get a three star rating for every level.